When you think of IBM you probably don't think of consumer electronics, but the company's CEO came to Las Vegas on Wednesday to push IBM's Watson technology deeper into wearables and health. Ginni Rometti announced two partnerships around Watson, one with medical device maker Medtronic and the other with Under Armour, which is known for sportswear but now also sells connected fitness gadgets. Rometti is the first CEO of IBM to give a keynote at CES. She was there to promote Watson's artificial intelligence services, which she claimed are needed to analyze the floods of data generated by all the connected devices at CES. "Going digital is not a destination, it's a foundation," she said. "What will differentiate you is understanding all that data." IBM and Medtronic are using Watson's analytics as the back-end for an app which they say could help the roughly 400 million people in the world with diabetes. The app collects data from Medtronic's insulin pumps and glucose monitors, and analyzes it to predict when a diabetic's blood sugar will fall to dangerously low levels. Omar Ishrack, Medtronic's CEO, said the companies can predict such a drop three hours before it happens, allowing the person to take corrective action. He said they've tested the app with 600 patients with positive results, and plan to release it broadly in the summer. The companies didn't say how much the service would cost, however, and it's unclear how many people will be able to afford it. Under Armour is at CES to try to break into the fitness wearables market. It sells a wristband and a chest strap that monitors a person's heart beat, as well as a scales that it says can track a person's weight and percentage of body fat. The data is collected together, and Watson will analyze it and and make recommendations to help people lose weight and get fitter, said Kevin Plank, Under Armour's founder and CEO. Ultimately, he hopes to increase people's interest in fitness as a way to sell more sportswear, a fact he didn't try to hide. "The more people work out, the more shirts and shoes they buy, so there's a logic to all this," he said. Rometti was also joined by the president of Softbank, to talk about how the companies will combine Watson's analytics with Softbank's Pepper robot to market services to businesses. Pepper is already being used by Nestle in about a hundred of its stores, where it greets customers, asks them what type of coffee they like and makes recommendations for the type of coffee machine they might want to buy. 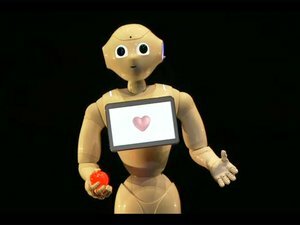 But Pepper can gather all kinds of data, including how many people interact with it, their gender, and even their emotion. The idea is to take all that data and use it to hone marketing and sales strategies. Pepper has a gentle voice and wooed the CES crowd with some cute antics. But when its computerized voice declared “I'm a social-humanoid robot designed by Softbank” it didn't sound very human.